There is a strong interlinkage amongst all these forces of change influencing the automobile industry. These have to be addressed consistently and strategically to ensure competitiveness. Since pollution is caused by various sources, it requires an integrated and multidisciplinary approach. The different sources of pollution have to be addressed in an integerated approach to acheive the objective of cleaner environment and meet National Air Quality standards. While each one of the four factors mentioned above have direct environmental implications, the vehicle and fuel systems have to be addressed as a whole as requiste fuel quality is required to meet the emission standards. In India, vehicle technolgy has evolved to meet the emission and safety regulations notified as per the Auto Fuel Policy specifing the emission road map and safety regulations as per the Safety Road map adopted by the CMVR-TSC, respectively. Today the vehicle technolgy in India is at par with the international bench marks as Indian safety standards are being alligned with Global Technical Regulations (GTR) and UN Regulations. India is a signatory to UN WP 29 1998 agreement which develops GTRs. India actively particiates in the UN WP 29 body and contributes significantly so that the GTR reflect the driving conditions and requirements of the developing countries. The Auto Fuel Policy 2025 was submitted to the Minstry of Petroleum & Natural Gas (MoP&NG) which had constituted an expert committe for the formulation of the same in December 2013. The document is currently hosted at the MoP&NG's website. 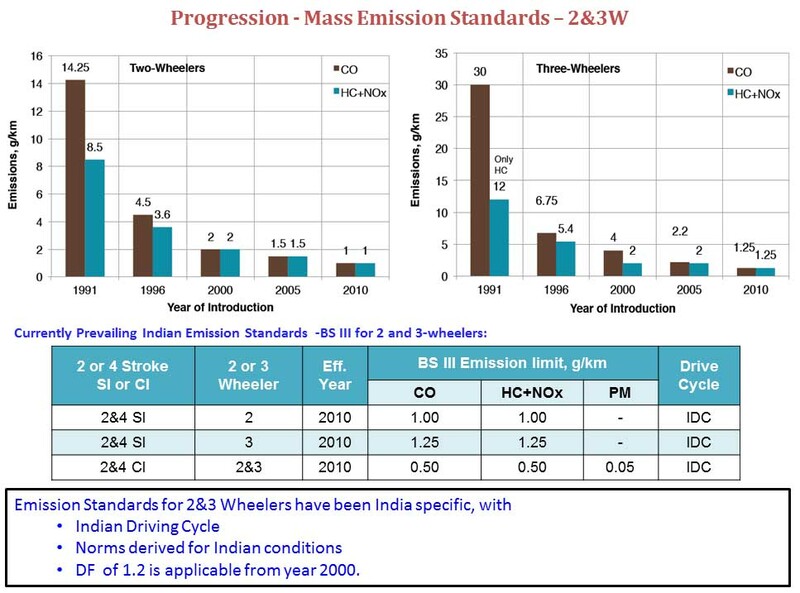 This policy document laid down the emission and fuel road map upto 2025. 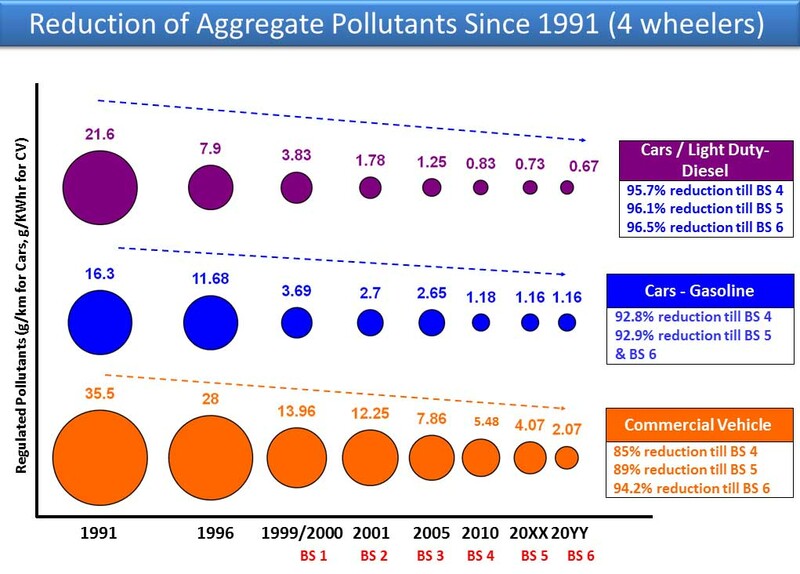 It has been estimated that at any point of time, new vehicles comprise only 8% of the total vehicle population. In India, currently only transport vehicles, that is, vehicles used for hire or reward are required to undergo periodic fitness certification. The large population of personalised vehicles are not yet covered by any such mandatory requirement. In most countries that have been able to control vehicular pollution to a substantial extent, Inspection & Maintenance (I&M) of all categories of vehicles has been one of the chief tools used. Developing countries in the South-East Asian region, which till a few years back had severe air pollution problems, have introduced an I&M system and an effective traffic management plan. Inadequate and poor quality of road surface leads to increased vehicle operation costs, thereby increased pollution. It has been estimated that improvements in roads will result in savings of about 15% of vehicle operation costs. The need for an integrated holistic approach for controlling vehicular emissions cannot be over-emphasised. More importantly, the auto and oil industries need to come together for evolving fuel quality standards and vehicular technology to meet the air quality targets.